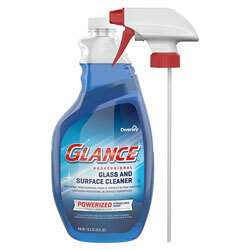 Formulated with ammonia and powerful surfactants to deliver professional cleaning results. Wipes clean and dries fast for a streak-free shine. Ideal for schools, offices, breakrooms, day care centers, restaurants and other commercial facilities. Professional strength formula for jobs big and small. Application: Countertops; Glass; Mirrors; Sinks; Stainless Steel; Applicable Material: Countertops; Glass; Mirrors; Sinks; Stainless Steel; Chemical Compound: Diethylene Glycol Butyl Ether; Dirt Types: Fingerprints; Grease; Grime; Haze; Smoke Film. Glass Cleaners from Diversey! 137 In Stock today.